Teaching and beyond. Being a teacher is a hugely rewarding profession; seeing a child’s eyes light up after grasping a new piece of knowledge is invaluable. As a teacher, you are a guide to the world and enable children to fully maximise their talents, potential, and imagination. Each day you will make a difference to the lives of 30 children. Every day is different. Teaching is challenging and frustrating, but every day is different and each day is as exciting and stimulating as the next. Every day you will learn more about your own vocation, children will ask you questions making you dig deeper and some days you learn just as much as the children. Achievement. Not only are you developing the minds of children and influencing them to progress, you are also developing and nurturing your own career. Progression in teaching especially in the UK is innovative. 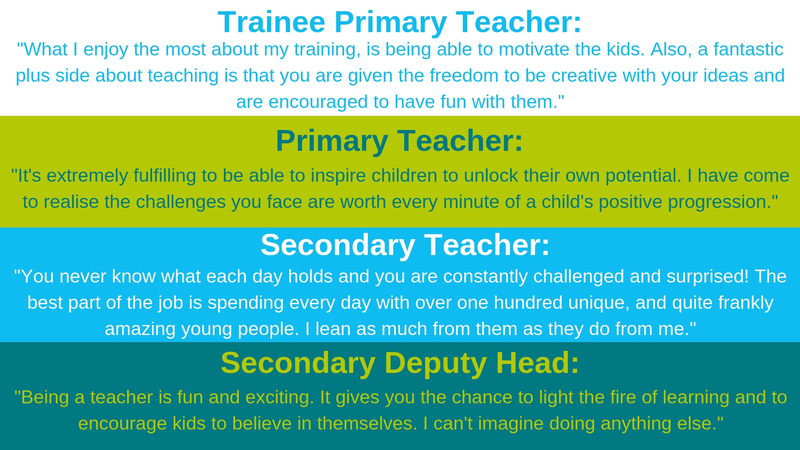 If you have high aspirations you can develop your teaching career whether you see yourself to be a Subject Coordinator, Head of House, Deputy Headteacher or even Headteacher. Creativity. Every teacher is different and the teaching profession provides individuals with the opportunity to be pioneering in the classroom. Teaching gives you the flexibility to develop your teaching styles to meet the needs and demands of your students. Happy. There are highs and lows of every profession but the highs of being a teacher outweigh the lows. You have the potential to provide a happy and safe environment for children to express their imagination and character. Humour in your classroom can be very beneficial and allows you to finish, even a challenging day, happy. Speaking to a serving teacher, who can talk to you honestly and objectively about their experiences of teaching, can help you make an informed decision about whether teaching is the right career for you. They can share their knowledge on topics such as behaviour management, workload management, subject knowledge and the curriculum. You can talk to a teacher by phone or email, and sometimes face-to-face at Teaching Agency events (subject to availability). If you are considering a teaching career and would like further information, contact the Kent-Teach team. In addition, visit our Routes into Teaching pages to find the best option for you.